So many of you have requested these larger sized, heavy classic twist bracelets (AKA “Horse Whisperer” bracelets) by the Tahe family, that I am posting globally that they have just come in. It is first come, first served. We now have them to fit wrists from size 5 3/4″ to 8″ but quantities in the larger sizes are limited. Click on the photo to take you to the list of sizes available. To see when we list new items, keep an eye on our NEW PAGE. 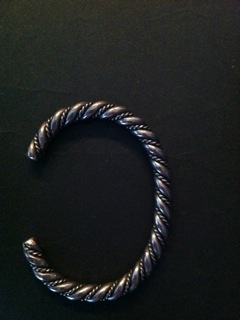 I found a silver twist cuff bracelet in my mother’s jewelry box when we were clearing it out after her death. Can you tell me anything about them? I assume it is native Indian made? How old are they? It matches the #BT288B one on your page. Any info would be great! Thank you…. 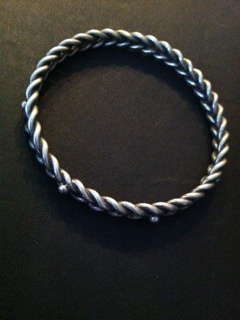 The first photo is indeed like the Classic Twist Bracelets on our website. They have been made for many years by various Navajo silversmiths, most notably the Tahe family. It is a traditional bracelet and comparing yours to both contemporary and old twists, I’d say yours was likely made sometime in the last 40 years but to get more specific would be difficult. The bangle bracelet made with flat twist is more unusual and it might or might not be Native American made. Are there any hallmarks stamped inside? It is similar to our flat twist cuffs which are also made by the Tahe family. Some prefer the flat surface as more comfortable.